Sacrifice of the cow was not an integral part of the festival and was not a religious requirement under Islam…. State Govt agrees to stop nuisance of slaughter in public from next year. No animal slaughter in public place: HC to West Bengal. Upendra Bharti | HENB | Kolkata | Aug 21, 2018:: The Calcutta High Court held on Tuesday, a day before Eid­ uz­ Zoha, that sacrifice of the cow was not an integral part of the festival and was not a religious requirement under Islam. The division bench of Chief Justice Jyotirmay Bhattacharya and Justice Arijit Banerjee cited a Supreme Court ruling to underline the observations, directing the state government to incorporate this clause in its notice to be issued regarding the observance of the festival on Wednesday. The Muslims of the WB are ready to observe Bakri Eid (Eid –al –Adha or Eid­ -uz­ -Zoha) on Wednesday and on Thursday in many places as continuation of the festivity of animal cruelty on roads amidst the pool of blood of cows and buffalos. The bench also asked the government to mention in the notice that the slaughter of animals, including cows and buffaloes, was “strictly prohibited… in open public space”. Violating the provisions of West Bengal Animal Slaughter Control Act, 1950 and disproving various orders delivered by the court of laws, the State machinery (Govt of WB and its Police) is allowing illegal slaughter of cows and buffalos of tender ages in public places only to protect its Muslim vote bank. The division bench passed the order after state advocate general Kishore Dutta sought a revision application for an order passed by the same court on August 16. “The necessary infrastructure to strictly adhere to the provisions of the Act is not available with the state,” Dutta said. He also submitted that the state did not have enough slaughterhouses and there was also a dearth of veterinary surgeons and officers. Dutta added that the government would take steps to adhere to all the provisions of the Act by the next year, prompting the division bench to express its “surprise”. But it allowed the government time till the next calendar year to implement all these provisions while adding the two important clauses to be included in this year’s notice itself. Then it is clear that the State Govt have to take necessary steps to stop cows and buffalo slaughter in any public places in the domain in West Bengal. Read the order of Honb’le Calcutta High Court in Slide Share. Advocate Meghnad Dutta, appearing for Rajyashree Chaudhuri (a social activist, kin of Netaji and now National President of Akhil Bharat Hindu Mahasabha, mob. 9903300466), said they would wait for the government to follow the order next year. Subhas Chakraborty (mob. 9748454472), the WB State President of Akhil Bharat Hindu Mahasabha has urged the public to report public nuisance of Bakri Eid slaughter at Dial 100 and send all documents of Bakri Eid cruelty and slaughter of cows in public places at the following email ids upananda.br@gmail.com, nbns23111977@gmail.com and rajyashreechaudhuri@yahoo.co.in with date, time and place. “Please send us all the documents and pictures of violations of WB West Bengal Animal Slaughter Control Act, 1950 in public places by slaughter cows of tender ages and creating public nuisance by making slaughter in open spaces during Bakri Eid with the names of respective SDO, BDO, OC of the PS and Two three Muslim offenders. We will draw them all in Calcutta High Court in due time,” Chakraborty urged the concerned citizens through HENB. Eminent Hindu interlocutor, Save Cow Crusader and HinduExistence Website Editor, Upananda Brahmachari thanked the Honb’le Calcutta High Court for their land mark judgement and appreciated the timely effort of Akhil Bharat Hindu Mahasabha to prevent rampant cow slaughter in West Bengal. 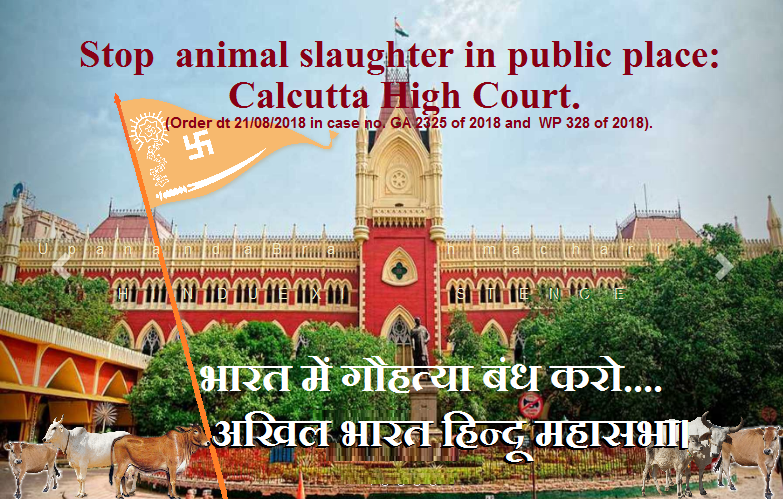 This entry was posted on August 22, 2018 by hinduexistence in Ban Cow Slaughter, Cow Protection, Demand for Cow Protection, Goraksha, Hindu Demand to Ban Cow Slaughter and tagged Akhil Bharat Hindu Mahasabha, Calcutta HC directs WB state govt, Calcutta High Court News, Cow slaughter banned by Calcutta High Court, Cow slaughter in ‘Bakri-Eid’ banned by Calcutta High Court, IDUZ-ZOHA, No animal slaughter in public place: CHC, Rajyashree Chaudhuri, Subhas Chakraborty, WEST BENGAL ANIMAL SLAUGHTER CONTROL ACT 1950.